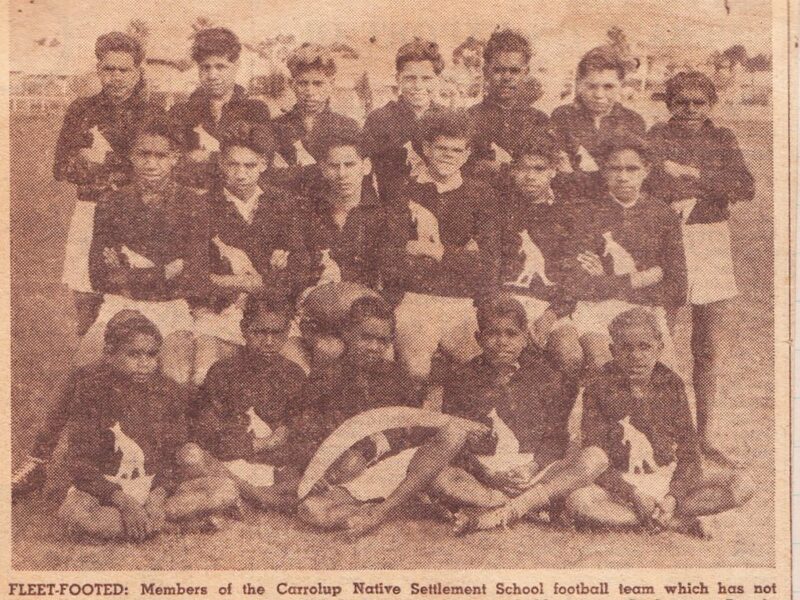 The 1949 Carrolup Native Settlement School football team that won two football games in Perth in September 1949. They were 'Never Ever Beaten'. The West Australian 1st September 1949. 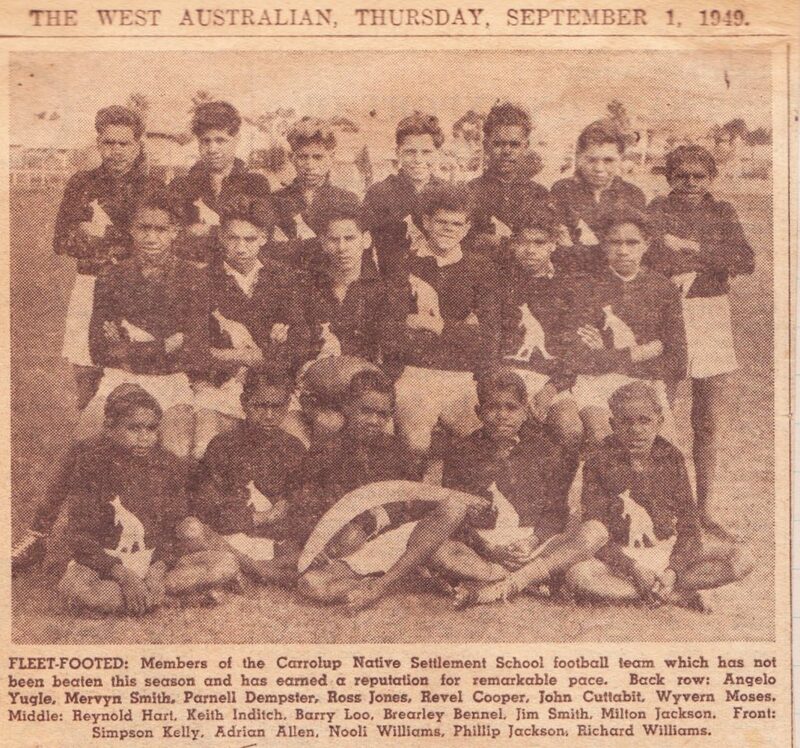 Aboriginal boys at Carrolup Native Settlement weren’t just wonderful artists, they also had a fantastic football team. They played local schools and won very easily. For example, in 1949 they beat Katanning School by 21.19 to 1.2 and Wagin School by 18.7 to 0.3. In September that year, they were invited up to Perth by the Headmaster of Thomas Street School, John Stokes, who earlier had played a significant role in publicising the children’s artistic abilities. The boys spent three days in Perth, where they were billeted at the Hubert Street Baptist Church in East Victoria Park. Some of the Carrolup boys – some with boots, some without – showed remarkable pace and marking skills and the applause was spontaneous as it was deserved. Several became great favourites with the crowd. Parnell Dempster (No. 8), a rover, was outstanding. He broke away from the packs at great speed, turned, side-stepped and feinted like a veteran. Reynold Hart (No. 5) marked, led and kicked in the style of an accomplished half-forward and, being a left-footer, he was quickly dubbed Keith Shea by Subiaco onlookers. The tall captain, Barry Loo (No. 1), who has just started work in the Department of Native Affairs, dominated in the ruck and in Keith Indich (No. 2) had a tireless workmate in the ruck. Revel Cooper (No. 4) was cool in defence and Angelo Yugle (No. 9) was a nippy forward. Smaller players like Simpson Kelly (No. 10) and Phillip Jackson (No. 11) were tricky. Many a laugh went up as the ten-year old midget, Tom Dawson (No. 18), went for the ball and in his tireless running up and down the wings he must have covered miles during the match. After the game, an appreciative audience contributes £16 6s ($900 in today’s money) when a collection box is taken around. ‘Give them wings and they’d fly,’ says a Thomas Street player. The Carrolup team playing that day contains at least ten of the Carrolup artists—Parnell Dempster, Revel Cooper, Reynold Hart, Barry Loo, Keith Indich, Simpson Kelly, Milton Jackson, Ross Jones, Mervyn Smith and Philip Jackson. Was there ever a sporting team anywhere in the world that contained so many talented artists? At a function after the game, the president of the WA National Football League compliments Bill Gordon, Acting Superintendent and coach of the team, and Noel White on the good work they have done in building up such a fine team. Several trophies are awarded to the best players and Mr Middleton, on behalf of the Department of Native Affairs, presents each Carrolup player with a memento. Mr Stokes and Mr White thank the WA Football League for their big part in the team’s visit. On the morning of the second game at Subiaco Oval two days later, The Daily News publishes an article on The Footballing Boys Of Carrolup, which includes photographs and short comments about six of the boys. The Daily News of the following day reports that members of the crowd frequently call to Tommy Dawson to gather the coins they have thrown onto the pitch during the game. A ‘tarpaulin muster’ is eventually organised to gather the money and this nets over £70 ($3,900 in today’s money). The same newspaper has a photograph of Tommy Dawson with Revel Cooper. After the game, the Carrolup team are guests of the WA National Football League at the League semi-final game between Perth and West Perth. This game, attended by 20,000 people, takes place on the same ground about two hours after the Carrolup game takes place. We have no idea of how many people were in the ground for the Carrolup game, but the number must have been significant given the amount of money collected. During their visit to Perth, the Carrolup boys visit various places, including an ice cream factory. They take a boat trip to Fremantle harbor. They speak on two of Perth’s radio stations. © The Aboriginal Child Artists of Carrolup by David Clark and John Stanton, to be published in 2019. And if you haven’t already done so, then click on the photo to reveal the identity of the individual team members.